Found this on YouTube whilst looking for productivity related videos and I though that since it was Friday I would share it. Morcambe and Wise were a great eighties comedy duo in the UK. Their Christmas Specials were legendary but I am guessing my US readers will have never heard of them? All have a great weekend. This entry was posted in General Items, GTD General, GTD Videos and tagged GTD Videos, Morcambe and Wise on October 31, 2008 by Andrew Mason. After a few tweaks here and there the new theme is a go and I am happy to say that I now consider the new site as fully live. I still have to add a few plugins and add some content to some more pages but I guess this aspect of the site will be work in progress. I have never had a Contact or Advertise page on the site before. Please use the Contact page to contact myself for any matters relating to the site. I am also looking for guest bloggers so please use this page to contact me if you have an interest in writing for Did I Get Things Done. This site is for its readers so if you have any suggestions or criticisms, please do let me know so I can improve the site to benefit the readers. I am also starting to take related adverts from sponsors in order to help fund the site and the ever growing hosting and management costs. If you have a product you would like to advertise, please let me know via the Advertise page and we can hopefully work something out. I have quite a bit planned for the blog. I am trying to widen it from just a GTD blog to cover my main focus areas of Productivity, Motivation, and Self Development. GTD will always figure high in these as it is the methodology that I started to use over two years ago now. I thank you for being a visitor to my site and I look forward to achieving my goal of becoming the number one blog for Productivity, Motivation, and Self Development. I am currently hovering around the 2400 RSS Subscribers and I am trying to get to the next goal of 3000. This entry was posted in Blogging with WordPress, General Items, GTD General and tagged Motivation, productivity, self development on October 31, 2008 by Andrew Mason. Whilst going through some old posts from this blog, I pulled out a review of a great book that I read, and reviewed pretty much within the first month of launching this blog. 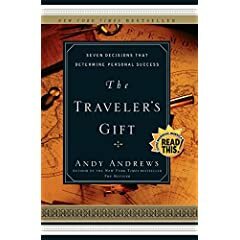 The book was the Travelers Gift, Seven Decisions that Determine Personal Success, by Andy Andrews. As the blog has just launched, I think I had around 5 subscribers and I knew all of them! The book talks about the Seven Decisions for Success. These are based around a story that the author takes you on. This is a motivational and self development book that is based on a fictional story, very similar to the great Og Mandino books. I created a free Mind Map for you all to download and read. 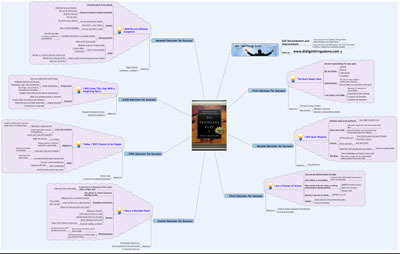 The Mind Map contains the overview of each of the Seven Decisions For Success as told in the book. Click on the thumbnail above to download the Mind Map or Follow this Link. Be sure to also check out the Original Post Review of this Book. I am thinking of doing some more Mind Maps like this so please let me know your thoughts and if you all like these or not. Feel free to pass this post on and please share it, I would love as many people as possible to benefit from the Mind Map. This entry was posted in General Items, GTD General, Mind Mapping, Motivation, Personal Development Book and tagged book review, Mind Mapping, Motivation, self development on October 29, 2008 by Andrew Mason. Evernote have just released version 1.4 of their fantastic note taking application for the iPhone. The biggest feature for me is the ability to mark a note as a favorite and then view it when offline. This means that you can now use the power of the desktop client to utilize the file storage capability of the Evernote iPhone application. I tend to add a lot of documents to Evernote from the Mac client, so the ability to mark these as favourites and always have them on my iPhone is a feature within Evernote that I have been waiting for. I did a post yesterday about the YouTube Video Project from Evernote where they are getting users to create video notes of how they use Evernote in their daily lives. There are so many ways to use Evernote and it seems that every time I speak to another Evernote user they enlighten me with some great way of adding another little trick to my ever growing arsenal. With the local file storage capability it may replace my need for the file syncing applications on the iPhone as I will be able to do pretty much what I need on the iPhone. 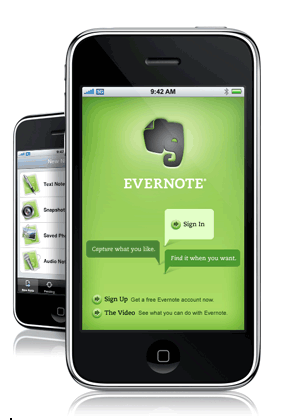 You can download the Evernote iPhone application from the iTunes music store for free. I am going to play with version 1.4 of Evernote over the coming few days and then I will let everybody know how I get one. How do you use Evernote?, I would love to know.. This entry was posted in Cool Software, General Items, GTD General, iPhone Productivity and tagged evernote, gtd, iphone on October 28, 2008 by Andrew Mason. This is a great little video from James Marwood about how he implements the Getting Things Done methodology for productivity. This is a very in-depth 11 minute video where James goes into his full paper and electronic based system. Great to see OmniFocus and also a MoleSkine. James has implemented pretty much the full GTD system including the tickler file. Check it out to see what you think.. I personally think it is great that so many people are giving back to the GTD Community with videos like this. James’ system seems very organized, which I am sure helps him achieve his daily productivity goals. This entry was posted in General Items, GTD General, GTD Videos and tagged gtd, gtd system, moleskine, omnifocus, Tickler File on October 27, 2008 by Andrew Mason. The guys at Evernote have started a YouTube project to get people to share how they use Evernote. Evernote really is a cool application for Windows, Mac, iPhone as well as the Web based Application. There are already some good replies, both video and text, check it out.. This entry was posted in Cool Software, General Items, GTD General, iPhone Productivity and tagged evernote, iphone on October 27, 2008 by Andrew Mason. Well, my new theme is up on the site but not yet live as I still have to tinker with bits here and there to improve the way it works and looks. I have been a bit under the weather this weekend, picked up some viral bug from my kids which has left me a bit ill.
Hopefully I will be able to get the site live tomorrow with all the new gizmos and gadgets. I have some great ideas for new WordPress Plugins after seeing some great presentations at the A4U Expo. My first link for this week is a little gem that I picked up from the University of California, San Francisco about controlling email before it controls you. It is written by a student and staff writer and it is based on a presentation from Merlin Mann about GTD and managing your Inbox. The first tip is to check your email less often, one that I really agree with! My third link is a link direct download link to the OmniFocus OmniFidget dashboard widget. That is a bit of a tongue twister. I do not use the dashboard a great deal but I will see if the widget is any use, looks to be just a novelty factor so far. My fourth link is a link to a post about the Ye Olde Tickler File from Examiner.com. I note a good link to John Kendricks blog on this page, well done John! My fifth and last link for this week is to GTD-Free. This is an app that seems to be coming up a lot and I must admit that I have not yet tried it out. I have added it to my review list for GTD Apps. Well, this rounds off this weeks lists. Just checked the preview of this post and it looks awful. Got to get the CSS changed to make it look prettier. I think the post font is also too small. Calling it a night now as I don’t feel too clever. This entry was posted in General Items, GTD and Productivity Links, GTD General and tagged gtd, GTD-Free, links, Ticker File on October 26, 2008 by Andrew Mason. I have mentioned in a few posts that I have been working on a new theme for this site and also looking to update the content to broaden the sites horizons. Well, I am glad to say that the new design is imminent and hopefully will be on the site in the next couple of days. I have used Unique Blog Designs to carve me a custom theme to facilitate my new launch. Got a few things planned for the new site that should widen its appeal. Over the next few days the format and layout may go a bit strange whilst we iron out any issues. Look forward to speaking to you all via my updated blog. This entry was posted in Blogging with WordPress, General Items, GTD General and tagged Unique Blog Designs, Update on October 23, 2008 by Andrew Mason. I cannot believe that I have never done a Top 5 list on this blog. In fact I have never done a blog entry based around a list before so here goes. What better place to start than with a list for my Top 5 Productivity Tools on the iPhone. I love my Apple iPhone. it has to be the single gadget that has most affected my productivity. Being an advocate of the Getting Things Done methodology, I love to talk about ubiquitous capture, and the iPhone is my capture device of choice. In my opinion, Apple have brought together an amazing collection of tools that you can carry around as a single device in order to help you achieve what is required from your working day, as well as leaving some room for the fun and social aspects of the iPhone. Here are my Top Five iPhone Apps for Productivity. Calendar – Bit of an obvious one this but my life runs around my Calendar. The built in Calendar application is one of the most used apps on my iPhone. I sync to my desktop using MobileMe which now works fantastically after the initial teething problems. I can enter an appointment on my iPhone or on my Mac and they sync in the cloud without having to do anything. What a great technology and it means my calendar, and work schedule is always on my iPhone. OmniFocus – OmniFocus is the current GTD application that I use. I have multiple projects configured both for my home and work lives and this application is in constant use. I capture my thoughts to OmniFocus and they sync again over MobileMe back to my Mac. I have not really played with the location aware profiles yet but I am sure I will. EverNote – I record all my receipts and photo notes straight to Evernote. I have every invoice and purchase order in PDF from my business as well as all the other files that I want to share between multiple locations stored in EverNote. The Web application, Mac Application, and iPhone application make this a killer note taking and storing app for me. iBlueSky – I recently reviewed iBlueSky, the newest Mind Mapping application for the iPhone. I have found myself using this app rather than creating paper Mind Maps. The developer assures me that my little niggles with it are being addressed in a later version for which I cannot wait. Zenbe – Zenbe for me is about making lists. OmniFocus in my opinion is too heavyweight for simple recurring lists so I have tended to create these in Zenbe. These sync with Zenbe on the Internet and the very simple click process for ticking off your list items makes this my list manager of choice. I would love to hear from the rest of you to see what your best apps are for productivity on the iPhone. This entry was posted in General Items, GTD Applications, GTD General, iPhone Productivity, Mind Mapping and tagged evernote, gtd, iBlueSky, iphone, omnifocus, zenbe on October 21, 2008 by Andrew Mason. I came across the ProBlogger site when I first got into blogging a couple of years ago. I used to read the ProBlogger blog and picked up some great tips from it in the early days. 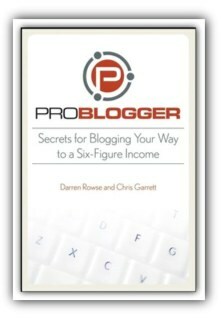 The ProBlogger blog is written by Darren Rowse. The Problogger book caught my attention when it first came out although I never got around to buying it. I then met Chris Garrett at a Northern UK Bloggers Meetup and thought it was only right at this point to buy the book and see what I could learn. One Amazon order later and the book arrived. The book is 211 pages long split into 10 chapters. Each chapter is written by either Darren Rowse or Chris Garrett. The book is about blogging for money. The reader is introduced to the concept of blogging and taken through the necessary steps to set up your blog and the popular blogging platforms with the emphasis being placed on WordPress as the blogging platform of choice. The chapter on blog income and earning strategies was very useful and provided me with a great insight into what can be done with your (and my) blog. The book then goes into blog networks and blog promotion and marketing. The main purpose of the book is how to start a blog and monetize it in order to one day become a six figure blogger. I must admit that the blogger lifestyle does appeal to most but in practice the self discipline needed to write is not for everybody. I wrote a review of a great book called the War of Art, be sure to check this out if you have not already done so. This book covers the demons, or muses that we have to fight against in order to produce creative work. One statement from the War of Art that I love is the following. The act of writing is not hard, the act of sitting down to write is what causes us the challenge. The same can be said about blogging. If you can get over the first hurdle of starting a blog, and the second hurdle of passing the six month stage, as I heard over 90% of all blogs stop after six months, then you are in a good position to make the blog pay. The book is written by two authors and it is clear from the writing style that the book was split into two, with each author writing their own content. The book is complete, and the chapters flow nicely into each other. All the jargon is explained before it is used and all in all I really like this book. The typography of the book is good and to the usual Wiley standards. This helps in making the book a pleasure to read. I am still amazed when I read books like The Magic of Thinking Big and see how bad the type is. This makes the book much harder to read in my opinion and maybe this is one area where the second generation of eBook readers will really win. I feel that I could give this book to a novice blogger and they would get great benefit out of it as well as to a more advanced blogger who would be able to skim a lot of it but still pick up some very good advice. I learned some things from the book and it gave me some great ideas. That makes it worth the price. As always, would love to hear any comments about this review, or the book. This entry was posted in Blogging with WordPress, General Items, GTD General, Personal Development Book and tagged Personal Development Book, problogger on October 20, 2008 by Andrew Mason.